The automation of work, including the use of robotics and Artificial Intelligence (AI), is expected to rapidly increase. In fact, recent research by think tank ‘Centre for Cities’ found that one in five jobs in Britain will fall victim to automation by 2030. These findings are further echoed by auditing firm ‘PricewaterhouseCoopers (PWC)’, who estimate more than ten million UK workers will be at high risk of being displaced by robots within the next 15 years. 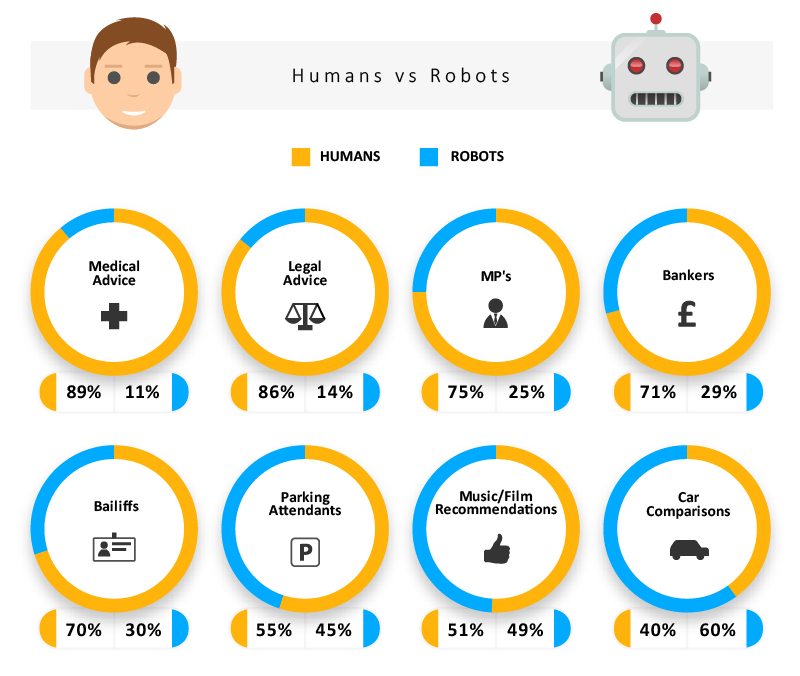 Reboot Digital Marketing found that when making car comparisons with the intention to eventually purchase, a significant percentage of Brits would want robots (60%) aiding them instead of humans (40%). Thereafter, Brits would be most inclined to accept music/film recommendations from robots at 49% - though 51% would still opt to do so from other people (family, friends etc.). Shai Aharony, Managing Director of Reboot Digital Marketing commented: “Automation is undoubtedly on the rise. As the technologies which underpin its development become more sophisticated and efficient, certain industries will certainly face the real prospect of robotics and Artificial Intelligence disrupting their traditional flow of human labour. The AI invasion: who’ll be first to get taken over?